Designed by Bootstrap Farmer to give your garden a little more color. 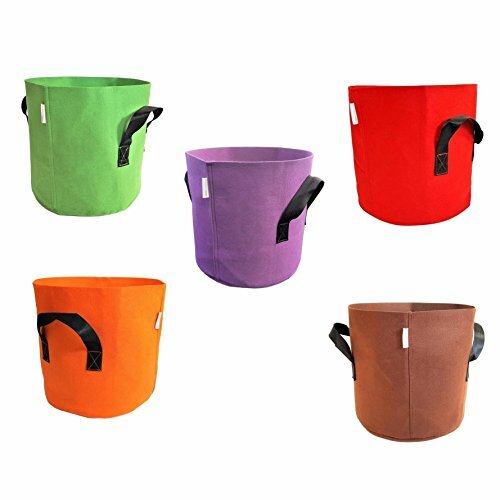 These colorful grow bags are perfect for your hobby or commercial growing needs. We decided to produce these grow bags for our farm at a reasonable price and excellent quality. The breathable fabric provides optimal drainage and aeration. It encourages "root pruning" rather than "root circling" which you get from traditional plastic pots. Root circling causes girdling that restricts water transportation and leads to structural defects. These will last you multiple seasons under normal conditions and fold flat for easy storage. Ideal for anyone that has limited growing space or wants to move plants around. Can be used for indoor/outdoor hydroponic systems, greenhouses or your front steps. Great garden planting pots for tomatoes, flowers, vegetables, potatoes, herbs and much more. Container gardening pots Dimensions: 12" deep x 13" diameter. 12" deep 13" dia 7 liquid gal. Flower pot, grow tomatoes, herbs & more! If you have any questions about this product by Bootstrap Farmer, contact us by completing and submitting the form below. If you are looking for a specif part number, please include it with your message. Root Mushroom Farm-Mushroom Spawn/Growing Bags(10 Counts), 0.2 Micron Filter, Large Size 8" X 5" X 19"